Agustin "El Guty" Murillo Pineda (born May 5, 1982 in Tijuana, Mexico) is a Mexican professional baseball infielder for the Sultanes de Monterrey of the Mexican Baseball League. He was signed by the Arizona Diamondbacks as an undrafted free agent in 2002 for the baseball legend Jack Pierce. 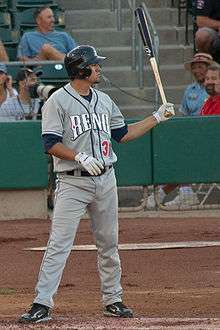 In 2008 he was loaned to the Mexican League, where he was a candidate for Most Valuable Player. ↑ Gilbert, Steve (May 15, 2009). "D-backs Minor Leaguer suspended: Murillo out for 50 games after testing positive for Clenbuterol". mlb.com. Retrieved 2009-07-23.